The consensus forecast of the odds of an El Niño developing in the winter of 2014/15 has increased 52% to 64% since early March. Despite this greater model consensus, there remains considerable uncertainty as to when El Niño will develop and how strong it may become. This uncertainty is amplified by the inherently lower forecast skill of the models for forecasts made in the spring. While ENSO-neutral is favored for Northern Hemisphere spring, the chances of El Niño increase during the remainder of the year, and exceed 50% by the summer. 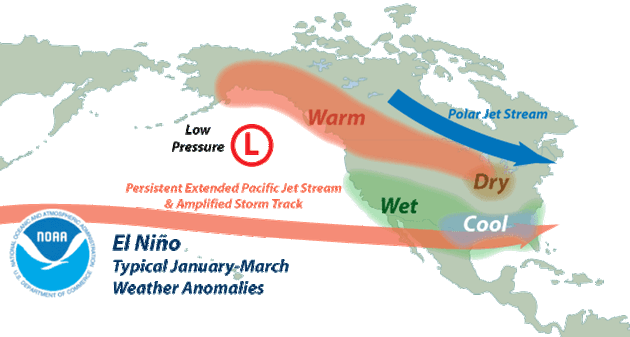 El Niño can lead to significantly wetter winters in northwest Mexico and the southwest United States, including central and southern California. The Coastside is on the edge of the affected area, but some climate scientists are predicting that if there is an El Niño next winter, it could be particularly strong.